When it comes to outdoor lighting, there are unique challenges facing each garden or out door space. This beautifully simplistic exterior wall-light is the perfect solution to all of your outdoor lighting needs. 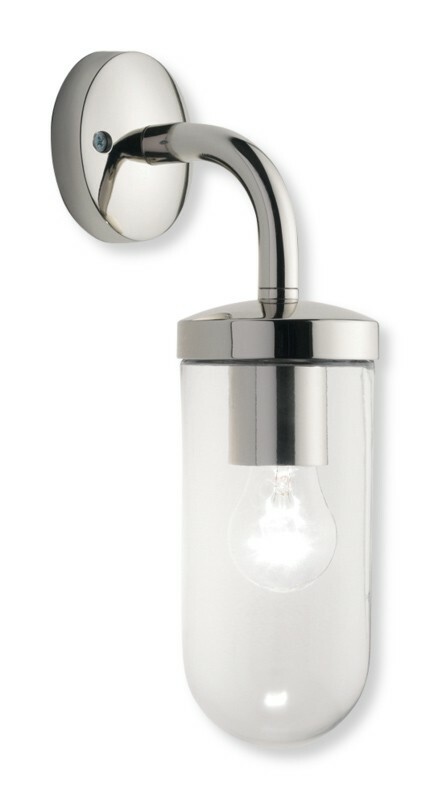 With a polished nickel finish, this wall-light is elegant yet tough. The polished finish means that this light fixture is durable for outdoor use. Through rain, sleet, hail, and snow, this exterior wall-light will stand-up to the elements. The crystal clear glass dome makes this outdoor wall-light excellent for clearly illuminating your yard or outdoor space adding attractiveness and safety. For a simple, yet elegant, solution for your outdoor lighting, this exterior wall-light is perfect for you and should also be considered for interior useage in the living, lounge and kitchen areas, as well as great features and benefits¬†for specification in commercial settings.